NASA Earth Observatory maps by Joshua Stevens, using data courtesy of Sean Cameron/University of Georgia and the NASA DEVELOP project team. Caption by Pola Lem. It’s no secret that Atlanta’s green space has long been turning gray. Parking lots and houses have sprung up in recent decades, with pavement replacing forested areas. In a city with already expensive wastewater treatment, all of this development has left even fewer opportunities for woodlands to contain and filter rainfall. But now, a coalition of researchers and conservationists is taking advantage of existing forests to bolster Atlanta’s natural defenses. 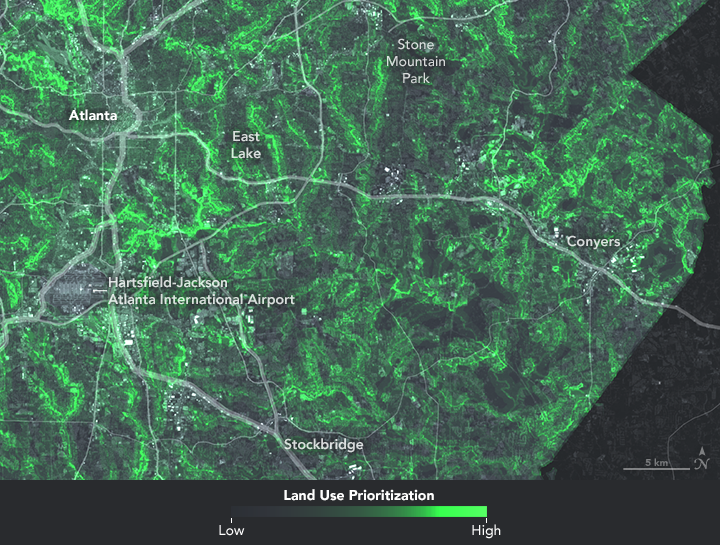 Using satellite data, researchers participating in NASA’s DEVELOP program have mapped Atlanta’s living infrastructure. “The goal was to help the Nature Conservancy identify locations across the metro region for land protection,” said Christopher Cameron, the project lead. Cameron and his team created a land use prioritization map, which shows important conservation areas in Atlanta based on criteria such as proximity to waterways and existing green infrastructure. Using this map, groups can focus their conservation efforts on spots with the most potential to improve local water quality. The Nature Conservancy, for instance, hopes to preserve more trees, which can filter untreated stormwater that flows over impervious surfaces (paved roads and concrete sidewalks). More forests, the idea goes, will soak up some of the wastewater currently inundating the city’s waterways and will improve local water quality. The group is one of many working to address wastewater and tree canopy issues, and Gottlieb hopes the DEVELOP data can help find areas where preservation efforts would be most productive. For instance, the project identified one area in East Atlanta (below) that has seen rapid demographic shifts and rising property values in recent years. “That area really piqued our interest,” said Gottlieb. “There’s lots of existing forest parcels in county hands or private hands that could so easily be torn down and turned into development.” She said The Nature Conservancy hopes to acquire or set aside these green resources, sparing them from becoming future development. This project was funded by NASA’s DEVELOP program, which uses Earth observations to address environmental and public policy issues. DEVELOP (2016) Atlanta Water Resources II. Accessed November 15, 2016. DEVELOP (2016) Atlanta Water Resources III. Accessed November 16, 2016. NASA Earth Observatory (2016, October 6) Ravenous Palms Devastate Puerto Rico’s Palms. NPR Code Switch (2015, November 23) An Atlanta Neighborhood Tries to Redefine Gentrification. Accessed November 15, 2016. The Nature Conservancy (2016) Georgia. Accessed November 15, 2016. CBS46 (2013, May 6) 50,000 Gallons of raw sewage spills into DeKalb County creek. Accessed November 15, 2016.